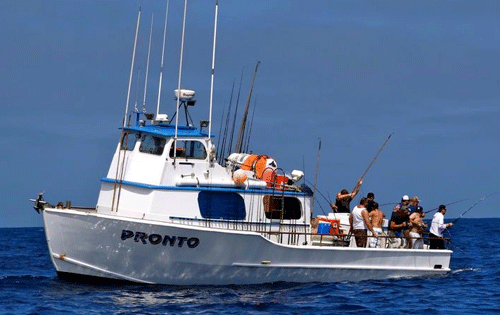 The Pronto is a great charter boat for groups up to 12 people looking to fish locally, the islands or even offshore for tuna. She is a 45'x13' fishing machine equipped with side scanning sonar, two fish finders, radar, satellite phone and two vhf radios. You are more then welcome to bring your own food and drinks since she has no hot galley(she sits up to seven people in the galley) available but she does have a coffee maker and microwave oven. For overnight or longer trips, she can sleep up to nine people. She holds plenty of bait for that hot bite or longer trips. a continental breakfast, and snacks. * Does not include visas or permits.